In 1977, the Hawk XP was introduced. Utilizing a 195-hp fuel-injected powerplant turning a constant-speed propeller, it offered the pilot 1,000 pounds of useful load and a 150-mph cruising speed for cross-country transportation. In 1979, optional integral fuel cells increased usable fuel to 66 gallons for a range of 938 miles with a 45-minute reserve. In addition to the standard four seats, an optional child’s seat could be added for extra seating capacity. With the 1981 model year, handling characteristics of the XP were significantly improved by the addition of rounded leading edges on the elevators. In June 1980, the Cessna FR.172K Hawk XP c/n FR17200656 was registered D-ELKU. Early 1993, the aircraft entered service with LFH Luftverkehr Friesland Harle "Die Inselflieger". Luftverkehr Friesland Harle was founded in 1983 and started its operations on 1 October 1983. The airliner operated scheduled and charter flights out of Flugplatz Harle near Wittmund-Carolinensiel. These scheduled flights to and from the East Frisian Islands of Baltrum and Wangerooge were operated before by LW Luftverkehr Wilhelmshaven-Friesland. On 1 April 2011, LFH Luftverkehr Friesland Harle was acquired by FLN Frisia-Luftverkehr Norddeich, but continued to use its own branding. From 1 November 2014, LFH Luftverkehr Friesland Harle (Carolinensiel) and parent Frisia-Luftverkehr Norddeich (Norddeich) merged into a single company under the banner FLN - Die Inselflieger (Norddeich). 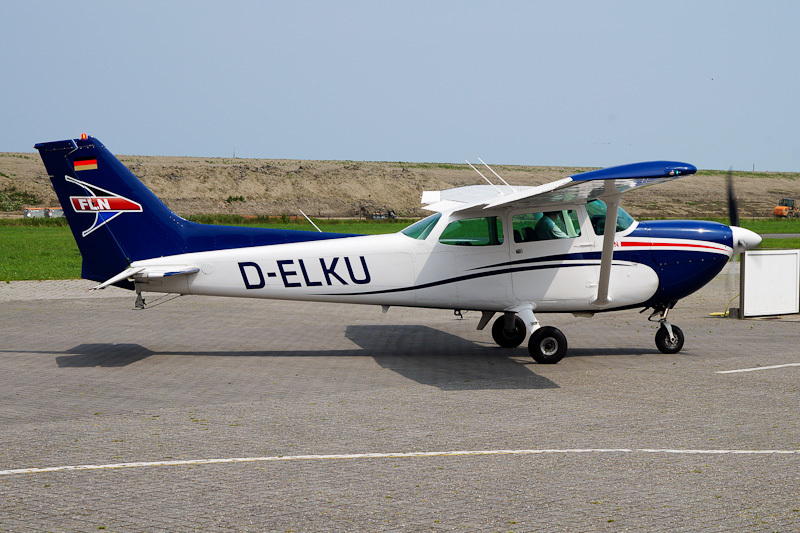 FLN - Die Inselflieger operates charter flights and scheduled services from Norden and Harle to the German islands of Baltrum, Borkum, Föhr, Helgoland, Juist, Langeoog, Norderney, Wangerooge. On 17 July 2015, the Cessna FR.172K Hawk XP D-ELKU was seen at Harle, painted in its new FLN colours.